If you follow our Facebook page, you know I’ve been on a major Indian food kick. I recently went in search of an Indian dessert to compliment a full Indian dinner I did during a recent weekend. I found this dessert and completely fell in love. It’s cool, sweet and spicy all at one time. It’s quick, easy, rich and it’s a probiotic boost all wrapped up in a dessert. My kids now ask me to make this with their yogurt every morning at breakfast. We’ve made this with both dairy yogurt and coconut yogurt with equally good results. I use a mixture of raw honey and stevia for sweetening, but you can use any sweetener of your choice. If you can’t get Greek Yogurt, take six cups of plain, whole-milk yogurt and tie it up in a kitchen towel suspended over a bowl and allow the whey to drain out of the yogurt for 24 hours before proceeding. Pop open the yogurt container and drain any clear fluid that has collected off of the top. In a bowl, fold together the yogurt, sugar and spices. Taste and adjust spices and add more sweetener if needed. Cover and allow to chill until serving time. 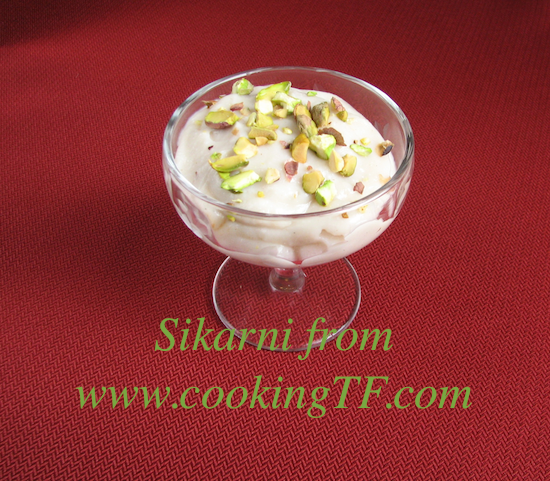 To serve, spoon the cold yogurt out into cups and sprinkle the pistachios on top. Happy Birthday to Me: Cheesecake Pops! Yes, you should do that! lol I added your spices to some thick milk kefir tonight (with a dash of vanilla for grins). Very, very tasty.